Whether you are a US citizen, a US Legal Permanent Resident (LPR), or a foreign national visiting the USA, the immigration law office of Fong & Chun in Los Angeles recommends that anyone who loses a passport or an LPR card report that loss to local law enforcement. A lost US passport is serious business. Report the loss or theft to local police and to the US Department of State immediately. You should bring the report with you when you apply for your new passport. Although getting a replacement from the US Department of State is a relatively simple matter, border guards will likely pull you aside the next couple of times you enter the USA at a Port of Entry (POE) to verify your identity. They may also ask you about the circumstances under which you lost the passport. Remember: the circumstances regarding the loss or theft of your passport will be in the computer at the checkpoint. A lost LPR card is almost as serious. A replacement is possible. US Department of Homeland Security (DHS) will charge you (at present writing) $355 to replace the card using Form I-90. They will ask you about the circumstances under which the card was lost or stolen; they may also ask for a copy of the police report. 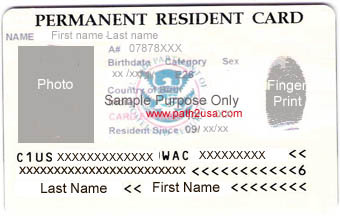 To process the replacement card, you will be sent an appointment for fingerprinting and identity verification. Until you get the replacement card, travel and job seeking will be awkward. After the I-90 is filed, use InfoPass to obtain a stamp in your passport to permit you to work and travel. If you lose your foreign passport, you should report the loss to local police and also to your country’s consulate or embassy. Also, you should apply to the DHS for a replacement of your I-94 Arrival-Departure Control Card.